Given my propensity for Israeli wines, this newsletter has often featured wines and/or specific vintages not commercially available in the United States. As the years go by, the list of Israeli wines not available in the United States continues to dwindle, making wine store hopping on trips to Israel less fun for those seeking the obscure bottle or trying to discover a new [and decent] winery. That said, there are still plenty of surprises and Ramot Naftaly Winery, the topic of this week’s newsletter is certain a welcome one. While not exactly a new winery as it was founded in 2003, the winery is among those who recently became kosher with the 2009 or 2010 vintages, and this was my first experience tasting the wines (given their quality, it will certainly not be my last). While any winery is first and foremost a business, hopefully a successful one, it is rare that the forces behind the winery are not passion-infused with a true love and belief for the product they are making and the land from which it is derived. When the resulting wines are delightful, it’s always an added bonus. Yitzchak Cohen, the passionate founder and wine-maker of the Ramot Naftaly is no exception and his wines are something special as well. On my recent trip to Israel I was originally scheduled to visit the winery located in the northernmost part of the Galil but had to cancel due to unforeseen circumstances. I was therefore delighted to find Yitzchak at the Ramot Naftaly with few other people around, given me a great opportunity to get to know Yitzchak, the winery and his delicious wines that, for the most part, are ready to drink upon release, are round and generous with subtle elegance and a warm grace to them. Located on Moshav Ramot Naftaly, the winery was founded in 2003 by Yitzchak Cohen with approximately 20 dunam of his own vineyards located in the Kadesh Valley (a little less than five acres) which are planted with Barbera, Shiraz, Cabernet Sauvignon, Malbec, Petit Verdot and Merlot is currently approximately 10,000 bottles, solely of red wines. Yitzchak was initially assisted by Tal Pelter (of the acclaimed non-kosher Pelter winery) and has subsequently learned wine-making at Tel-Chai College, home of the Cellar Master Program (founded by Yair Margalit, founder/wine maker of another highly acclaimed non-kosher winery – Margalit). His daughter obtained a Masters degree in oenology from the Hebrew University Faculty of Agriculture in Rechovot and currently assists Yitzchak in the winemaking process. As with most small [and upscale] wineries, the grapes were all harvested by hand. In addition to making his own wines, Yitzchak provides assistance to some of the other wineries located on Ramot Naftaly. While not [yet] available in the United States, Yitzchak is more than happy to ship the wines abroad and can be contacted at 054-798-3100 or via email at: yitzhak3@012.net.il. For those of you living in Israel, half the wine is sold directly from the winery with the balance sold directly to restaurants a few wine shops in the area. I highly recommend making you way up North and picking up some of the wines (especially the Barbera and Petit Verdot which are great and tend to sell out quickly). In addition to the wines listed below, I also tasted a 2009 Special Edition Cabernet which I reviewed in my recent Cabernet Sauvignon newsletter (#190) and they also produce a Malbec which I didn’t have the opportunity to taste but have procured a few bottles and will report back when I taste them. Ramot Naftaly, Shiraz, 2009: A full bodied wine with a deep and rich nose of crushed blackberries, currants, raspberries and black cherries, much of which follows through onto the palate together with near-sweet tannins that make the wine delicious to drink right now but that will hang on for another few years with good balance between the tannins, wood and fruit.. Hints of earth, slightly sweaty saddle leather and tar are complimented by some spicy oak (from the 12 months in new French oak barrels) and more fruit, presenting a delicious, round and mouth-filling wine. Drink now through 2014. Suggested retail is 95 NIS. Ramot Naftaly, Petit Verdot, 2009: One of the few varietal Israeli Petit Verdot wines (the 2008 Yatir is fabulous) and a rousing success. 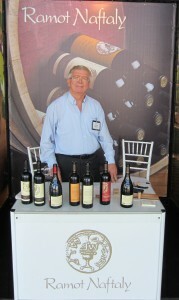 As with most wineries, the Petit Verdot was initially planted to be used as a blending agent (as with the Barbera below), but the quality of the resulting wine was so good that he decided to make it as a stand-alone varietal that received raving reviews so he increased production in subsequent years. A dense and inky black full-bodied wine from Petit Verdot grapes grown in terra Rosa soil that spent, like most Ramot Naftaly wines, 12 months in new French oak with a surprisingly relatively low 13% alcohol. A rich nose of black forest fruit with hints of red fruits wrapped in a solid robe of muscular tannins that bode well for the future of this wine but still need some time to settle down and play nice with the fruit, slightly spicy wood and acid. More black fruit on the nose, together with some red cherries and raspberries accompanied by baker’s chocolate leading into a long and lingering finish of fruit and minty chocolate. Give this one another 6 months to a year for the components to come together and then enjoy until 2015. Suggested retail is 120 NIS. Ramot Naftaly, Duet, 2009: A medium bodied blend of 60% Merlot and 40% Cabernet Sauvignon that spent 12 months in new French oak. Blackberries, red and black cherries and red currents on both the nose and palate together with black licorice, near-sweet wood, red plums and crushed Mediterranean herbs. The wine is drinking really nicely now and will continue to cellar through 2014. There were 2000 bottles produced and suggested retail is 85 NIS. Ramot Naftaly, Barbera, 2009: Easily my favorite of the Ramot Naftaly wines I tasted – a rich, deep and delicious full-bodied wine that spent 10 months in new French oak with loads of rich red fruit on the nose and palate together with near-sweet tannins, a touch o black pepper and a hint of bittersweet chocolate and a lingering finish. Blended with 5% of Petit Verdot, the wine is medium to full bodied with an extremely rich nose of black forest fruit, Mediterranean herbs. Drink now through 2014. Suggested retail is 130 NIS. Ramot Naftaly, Special Edition, Cabernet Sauvignon, 2009: The soft and medium bodied wine spent 12 months in oak and provides a nice nose of black currents, blackberries, a bit of cherry along with oak and noticeable herbs on the palate, accompanied by dark chocolate, tobacco leaf, a bit of tar and wood, with soft and well integrated tannins providing a pleasing backbone for this wine. Enjoyable now and not for long-time cellaring, this wine should cellar through 2014. Suggested retail is 60 NIS.